Ok, I confess…. I had to do something for anyone who was visiting because of my crochet carrots and peas on this months’ Mollie Makes cover. I’m not a very good blogger, as you can see by the date of my last post, so don’t expect too many miracles from me in that department. And here he is. 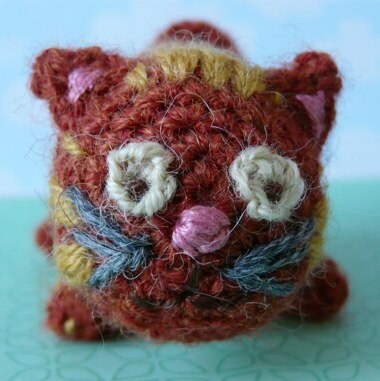 I can’t say I’ve ever been tempted by the ‘cute small crochet’ thing before, but I had a sudden urge to make small animals the other day, and this cat was the result. I have to say that I’m quite pleased with the way he turned out. 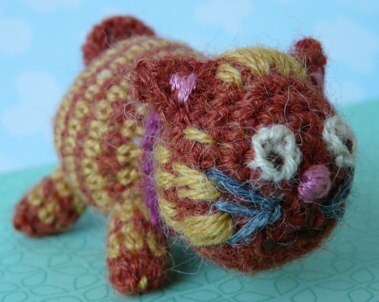 He’s not all that big – about 7cm long, and he’s made using Garnstudio Drops Alpaca. I just LOVE the colours of this range. I’m doing a much larger project with it at the moment, and I guess that was one of the reasons for the sudden urge to produce something small – I needed to do something which wasn’t going to take me weeks and months to complete. I’ve also just finished a crochet nativity set for Simply Knitting magazine which will be published in Issue 87. I had to do some animals for that, and although I was particularly wary of the camel at first, it was fun and it gave me a taste for the animals thing. Hello! I popped over after reading you in Mollie Makes and it’s lovely to read a fellow Bristol-based blog! I like the idea of geocaching too – if it’s what I think it is. That is beautiful! I love this cat!